My toddler wasn't rock climbing in just his socks, but this is what the SmartWool Toddler Socks I paid about $34.00 for for four pairs ($17.00 per two pairs on Amazon in October 2012). Greyson just turned 21 months and I bought these socks in the 2T-3T size back in October and didn't really start wearing them until December when it started getting cold. My son has average sized feet and doesn't grate his heels on sandpaper as these pictures might suggest. They emailed me back a form letter stating their "satisfaction guarantee," but didn't address the specific questions in my email. The thing is, their website says that "normal wear and tear" is not covered in the guarantee, so would they count this as wear and tear is what I had asked? Greyson has cheapo Old Navy socks from almost a year ago that haven't worn down at all. I probably got a 5-pack of Old Navy socks for $5 on sale. I haven't heard back from SmartWool yet on if they count this as normal wear and tear (I responded to their original email asking again to clarify the "wear and tear" part). If SmartWool responds and I am able to get new socks, I'll update everything here once I get the socks. I had bought these SmartWool socks because I'm really into warmth and wool and quality. 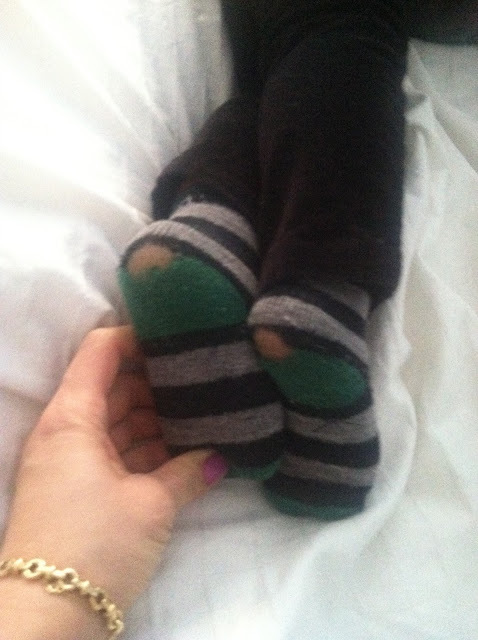 It's actually hard to find wool socks for toddlers, so it's too bad that SmartWool doesn't get this right. I'm disappointed that you can spend this much, think you're getting quality and end up with this. That's very strange. I always considered smartwool to be of quality but maybe they are just more well known. I recently bought a pair and was thinking about buying a couple more. This post is making me reconsider. The only question I have is-Did you wash your wool socks in wool detergent/hand wash them? Just curious. I hope that Smartwool has clarified themselves to you. I hate when companies do not respect or make a point to connect with their customers. Hopefully Smartwool got back to you, but this wear and tear is covered. You can take the socks back to a retailer (which I would always suggest buying at rather than Amazon for this exact reason) and they should let you exchange out the items. Otherwise, if you mail them to SmartWool they will send you new pairs.